Walter T. Varney founded Varney Speed Lines in 1934, and the company became Continental Airlines in 1937. Its mergers with Texas International Airlines in 1982 and Frontier Airlines, New York Air, and People Express Airlines in 1987 made Continental the third-largest airline in the United States. 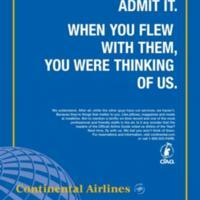 As this advertisement demonstrates, Continental prided itself on continuing to offer services including free meals, magazines, and pillows to coach customers long after other airlines ceased to do so. The airline could only justify keeping these services for so long and cut all of them before merging with United in 2012. 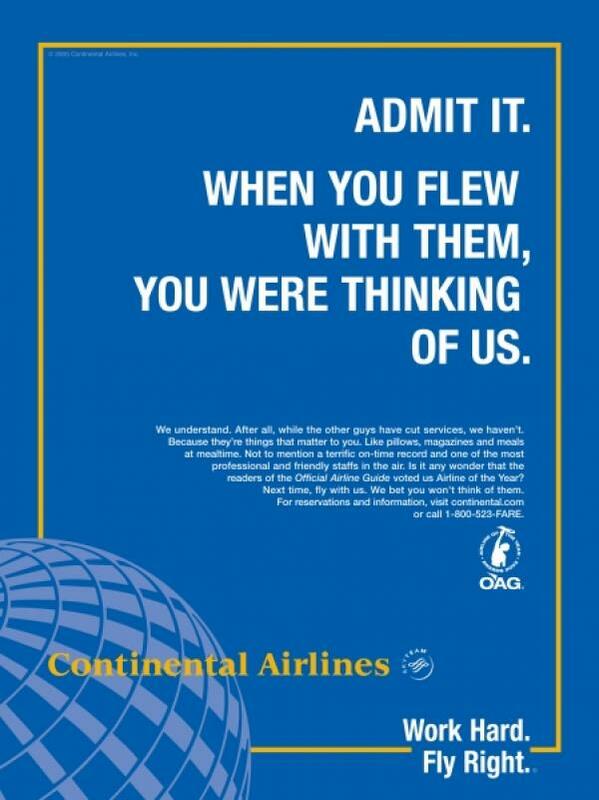 Continental Airlines, “Admit It,” The American Century, accessed April 20, 2019, https://americancentury.omeka.wlu.edu/items/show/394.